The story of this blog over the past few months has been that its author can't find the time to write on it. One of the reasons for this has been the exhilarating and absorbing finish to the baseball season, so with the World Series starting tonight I figure I must say a few things about it while I sit here in a coffeeshop/restaurant eating lunch. Despite the negative feelings for the Cardinals I've expressed a few times on this blog, I will be rooting for them to win what should be an exciting series against the Texas Rangers. Why? Because the unprecedented run this team has been on since the beginning of September and on into the playoffs has swept me up into their bandwagon. And I really don't like the Texas Rangers. The story for both teams is remarkably similar: high-scoring offense and deep bullpens. Both teams received minimal contributions from their starting pitchers throughout the playoffs, finding themselves calling upon relievers early on then mixing-and-matching throughout the games. Of course, as unpredictable as baseball always is, you can expect the starting pitchers to play the biggest role in this World Series. Texas boasts an incredibly deep and potent offensive attack, with five straight excellent hitters bunched up in the middle of the lineup. Really, it'd be hard to put together a better lineup than theirs, perhaps the only weakness is that there are so many right-handed hitters (Josh Hamilton and David Murphy being the only lefties) and you can expect Tony LaRussa to exploit that with his slew of hard-throwing righty relievers. The Cardinals also have a terrific offense; they led the National League in runs, on-base percentage, OPS, and tied for the lead in slugging percentage. They are led by the best hitter on the planet, Albert Pujols, and as Rany Jazayerli pointed out in his World Series preview, Pujols traditionally plays even better in the playoffs. I'm really looking forward to seeing the Rangers' late game flame-throwers having to face off against Pujols. The Rangers possess an extremely rare combination of three southpaw starters who are all capable of throwing in the mid-90s. The other guy, Colby Lewis, is right-handed and doesn't throw very hard but he's still a pretty damn good pitcher. The Cardinals counter with the righty/lefty combo of Chris Carpenter and Jaime Garcia atop their rotation, both of them succeed by keeping the ball low and generating ground balls. Their third starter Edwin Jackson is a very good pitcher (he has nearly identical strikeout-to-walk numbers compared to Carpenter and Garcia) but he really hasn't shown it lately, and fourth-starter Kyle Lohse isn't anything special at all but if he can keep the game close into the 5th inning, he'll have done his job. The Rangers have the clear advantage here. General Manager Jon Daniels has assembled an absolutely fearsome bullpen here and they are a major part of why the Rangers are here in the World Series. As I already mentioned, it will be really exciting to watch closer Neftali Feliz pitch against the middle of this St. Louis lineup. The Cardinals also relied heavily on their bullpen on their way here, in fact, their funky bullpen is one of the reasons I've come to like these Cardinals. They've got some characters in there and they can all pitch. Jason Motte is the closer and he's one of the meanest looking guys in baseball with beady eyes and a lumberjack beard, his short-armed, explosive throwing motion and 100-mph heat amplifies his menacing aura. I think the pundits and analysts give the Rangers the advantage here but with LaRussa pushing the buttons and showing a clear willingness to break from conventional bullpen usage (the team's saves leader Fernando Salas pitched in the 3rd inning already in this postseason), the Cardinals have the edge. Not only is Albert Pujols the best hitter on the planet, he's also the best defensive first baseman in baseball and probably one of the best defensive players in all of baseball at any position. Yes, he is that good. The Cardinal catcher Yadier Molina is also one of the best players at his position but the rest of the St. Louis defense is very poor. Nick Punto is a punch-line in sabermetric circles for his poor hitting, but he's a great fielder and if he gets any starts for the Cards he'll certainly improve their D. The Rangers have a clear advantage here as they've got a great defense. The keystone combo of Elvis Andrus and Ian Kinsler will certainly make some highlight reel double plays in this series and third baseman Adrian Beltre is one of my favorite players to watch in the field. We saw what happened to the Brewers and their crappy defense in the NLCS, so it's certainly possible that the Cardinals might lose some games by not catching the ball. The Rangers as a team struck out fewer than anyone else in their league and the Cardinal pitchers usually don't strike out too many hitters anyway so there should be plenty of balls in play and plenty of opportunities for Lance Berkman to make a mess of things out in right field. 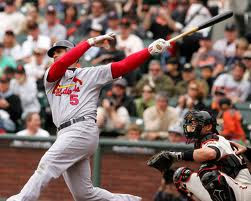 With the Cardinals having home field advantage (due to the National League winning the All-Star Game, if that makes any sense), a tactically superior manager, and the Albert Pujols factor, I think they make up for their shortcomings against an extremely well-rounded Texas team. The Rangers are favored to win and they look like a superior team on paper, but there's something about these Cardinals that reminds me of the 2004 Red Sox, a team that just looked like you could put them out on the field against anybody in any atmosphere and they would tough it out and find a way to win. Those Red Sox actually beat the Cardinals in the World Series that year in another matchup of powerhouse (the Cards won 105 games that year) versus Wild Card underdog, and the Red Sox steamrolled the birds in a sweep. I think this shapes up to be one of the best World Series matchups we've seen in a long time and I would put my money on the Cardinals to win in a long series with many tough battles. My pick: Cardinals in 7.